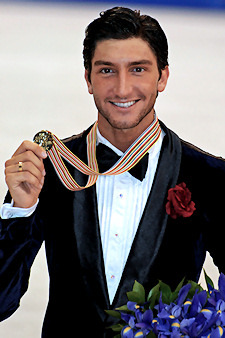 USA's Evan Lysacek won his first title at the 2009 World Figure Skating Championships after placing first in the Long Program. You couldn’t write a better script to what happened to Evan Lysacek in the last year of his skating career. The two-time U.S. Champion was forced to withdraw from the World Championships with an injury last season, and he was looking like his time had passed with somewhat average performances on the Grand Prix circuit last fall. At this season’s national championships, Lysacek had perhaps his poorest freeskate in recent memory, and barely qualified for the World Championships to be held in his adopted hometown. Lysacek showed up this week with a renewed spirit and has been a great ambassador for Los Angeles, taking time from his busy schedule to promote this competition as much as he could. His goal was to represent his country, his city, and the sport as well as he could. After finishing in second place in the short program, Lysacek was beginning to see the light at the end of this season’s tunnel. However, what he didn’t know was at the end of that tunnel was a pot of gold. After a 13-year drought, the United States finally has a new men’s figure skating World Champion. It seemed as if the 23-year-old was channeling energy from some of the great American performances this week; Todd Eldredge’s run to the 1996 World title after a disappointing showing at the national championship, Rudy Galindo’s fairy tale win in the same season in his hometown to win his only national title; and Michelle Kwan, also skating in her hometown in 2002, and winning her sixth of nine national titles. Lysacek will be remembered for pulling it together in one of those serendipitous moments when the stage is set exquisitely for something special to happen. Lysacek skated perhaps the program of his life; complete with eight triple jumps, level four on all but one element, and positive GoEs on every single element. The crowd was on Lysacek’s side as soon as he took to the ice for his skate, and never let up until the next skater’s name was called. At the end of his program, the audience spontaneously erupted to their feet, showering him with flowers, toys, and the loudest ovation of the week. Lysacek earned a personal best 159.53 points for his “Rhapsody in Blue” program, and his total of 242.43 points is a new personal best as well. Finishing in second place is Canadian Champion Patrick Chan, who took a huge step forward after placing ninth last season. Chan opened his Rachmaninov program in convincing fashion, landing four beautiful triple jumps and earning high marks for his combination spin and circular steps. However, the 18-year-old could only manage a single toe loop on the back half of a planned triple Axel-double toe loop combination, and then he later double a triple Salchow attempt. The Four Continents Champion did accomplish something that few skaters have since the code of points was implemented in figure skating; he earned level four on all of his non-jump elements. His segment score was 155.03 points to give him a total of 237.58 points overall. France’s Brian Joubert had perhaps the most disappointing skate of the night, plummeting from first place after the short program into third after an error-filled performance. Joubert opened with a quadruple toe loop, but then started changing his program on the fly. Though his next element, a triple Axel-triple toe loop was as perfect as it could be, Joubert began to look as though he was skating without a plan. The bronze medalist stepped out of a triple Axel, struggled with the landing of a triple flip, and then fell on his closing jump, an easy double Axel to seal his fate. Joubert’s disappointment also carried over to the non-jump elements in his routine to music from The Matrix soundtrack. The 2007 World champ received a level one for his closing flying sit spin, and failed to earn level four on any element. His freeskate total of 151.57 is far below his personal best, however, his total of 235.97 points kept him from slipping off the podium. Making a comeback of sorts is the Czech Republic’s Tomas Verner, who finished in 15th place last year, but skated consistently well this year to finish in fourth place. Verner opened with a strong quadruple toe loop-triple toe loop combination, and ticked off his checklist of three triple jumps before he started to have some trouble. Like Chan, Verner singled the back half of a triple Axel-double toe loop combination, but then regrouped and landed a nice triple loop. Verner then doubled his Lutz and flip, which essentially kept him off the podium. Verner’s total of 151.35 points in the freeskate was a season’s best, and his total of 231.71 points was just shy of his personal best. Skating an entertaining western-themed program, Italy’s Samuel Contesti followed up his silver medal at the European Championships with another stellar performance. Contesti won over the crowd with his tongue-in-cheek portrayal of a typical cowboy from a John Wayne movie, but it was the seven triple jumps that earned him Italy’s best finish at the World Championships in many years. Contesti eclipsed all of his personal bests in this competition, earning 148.47 points for his freeskate, and a total of 226.97 points overall. Finishing in sixth place is Japan’s Takahiko Kozuka, who had somewhat of a disappointing performance, making small errors on three jumping passes and failing to earn the highest levels on his other elements. Kozuka scored 142.83 points with his “Romeo and Juliet” program, and 222.18 points overall to edge out his teammate Nobunari Oda, who finished in 7th place. Oda opened with a whopper of a quadruple toe loop-triple toe loop, but then stepped out of a triple Axel attempt. The Japanese Champion then made some critical errors in the layout of his program that caused one jumping pass to be given zero credit. After Oda stepped out of his Axel, he did not attempt to tack on a planned triple toe loop to make the jump a combination. He then added the toe loop to the back half of his next element, a triple Salchow. His next element was a solo triple Axel, but because he already did a solo triple Axel, the element was scored as a failed sequence giving him three combination jumps in his program. As a result, his triple flip-double toe loop-double loop combination was not validated and cost him some nine points. Oda scored 141.67 points for his freeskate and 218.16 points overall. Moving up from 17th place after the short program to 8th overall is Kazakhstan’s Denis Ten, who had one of the best performances of the evening. The tiny 15-year-old placed sixth in the freeskate with a performance that won over the audience – a moment that was not lost on the tiny skater. Ten made a huge impact in his first trip to the World Championships, landing eight triple jumps and earning the third highest technical scores of the day. At the end of the program, Ten kissed the ice as he wiped tears from his face. Like Contesti, Ten eclipsed all of his personal bests in this competition, earning 142.89 points for his freeskate that gave him a final tally of 211.43 points. USA’s Brandon Mroz gave an uneven performance and landed six triple jumps to finish in ninth place in his first Worlds, combining with Lysacek to earn the United States three spots for next year’s Olympic Games in Vancouver, Canada. Finishing in 10th place is Andrei Lutai of Russia – his best finish at the World Championships. U.S. Campion Jeremy Abbott gave another trademark spotty performance and finished in 11th place equaling his finish from last season. Canadian silver medalist Vaughn Chipeur finished in 12th place, and heartbreakingly missed qualifying his country three spots for next year’s Olympics by omitting a double toe on the end of any of his jumps.